A thug with an “appalling record for violence” has been jailed for battering his partner unconscious when she dumped him. 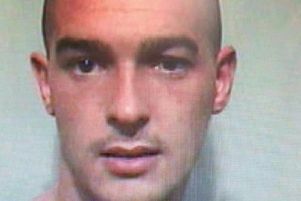 Sentencing cowardly domestic abuser Daniel Halpin, a judge pointed out that he had earlier convictions, including an assault on at least one previous partner. Paul Treble, prosecuting, told Liverpool Crown Court that Halpin began a relationship with Claire Etheridge in June last year and they moved in together the following month. However towards the end of the year they began arguing and in December she told him she wanted to end their relationship but he ignored her attempts to finish it. She tried to speak to him about it on the evening of December 18 and again the next night when he came home from work but he continued to ignore her, said Mr Treble. The following day she again told him to leave and they started to argue and he slapped her round the back of the head. The 30-year-old began collecting some of his belongings but when he came out of the bedroom, without saying anything he punched her to the left side of her face. She had trouble seeing out of her eye and went downstairs and asked him for help but he pushed by the left shoulder and swore at her. “When asked why he had done it he replied by laughing,” said Mr Treble. Her mum, who had been asleep upstairs, came down and called the police and officers arrived and arrested him. At hospital it was found that the victim had a potential fracture to the left side of her face and a jaw displacement and she needed to see a dentist because three teeth were hurting. Halpin, of Darlington Street East, Scholes, Wigan pleaded guilty to assault causing actual bodily harm. Sarah Griffin, defending, said that Halpin, a hotel kitchen porter, has been served the equivalent of six and a half months in prison while on remand. He is remorseful and has shown good victim empathy. Jailing him Judge Alan Conrad, QC, said that he had “an appalling record for violence”. “This was a particularly unpleasant domestic violence assault rendering the victim unconscious with unpleasant and painful facial injuries,” he said.